A Preliminary Hearing is where a judge actually determines whether there is enough probable cause to allow the charges to move forward towards trial, if necessary. This is basically a mini-trial to determine whether the prosecutor can prove that there is enough evidence for the case to move forward. Usually, a Preliminary Hearing will not actually take place, because if a Defendant wishes to move forward towards trial, and have a judge determine whether there is enough probable cause for the case to move forward, the prosecutor will often dismiss the case, and instead send the charges to the Grand Jury as an alternative to the Preliminary Hearing. The Grand Jury is comprised of a number of Arizona residents, who are on a months-long stint as members of the Grand Jury, and their job is to determine whether there is enough probable cause for a case to move forward towards trial. A presentation to the grand jury is made by the prosecutor, with the assistance of law enforcement officers, but does not, in nearly all cases, include the defense lawyer or the Defendant themselves. It is a one-sided presentation of the evidence, where the prosecutor has sole access to the Grand Jury, in an attempt to convince the Grand Jury that charges would be appropriate against the defendant. 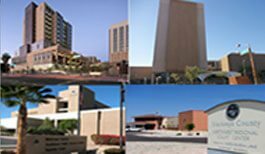 The courthouse in Mesa is called Southeast Regional Court Center (SERCC), and is comprised of primarily two courtrooms. The courthouse in northern Phoenix is called Northeast Regional Court Center (NE RCC), and also contains a small number of courts, which primarily handle Felony Preliminary Hearings.